Join Long Island's 3rd Annual Car Free Day on Tuesday, September 22th! 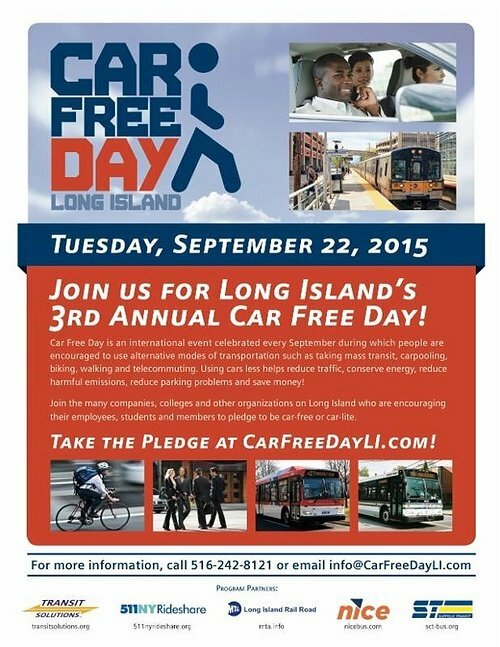 Long Island, NY - August 21, 2015 - Car Free Day is an international event celebrated every September during which people are encouraged to use alternative modes of transporation such as taking mass transit, carpooling, biking, walking and telecommuting. Using cars less helps reduce traffic, conserve energy, reduce harmful emissions, reduce parking problems and save money! Join the many companies, colleges and other organizations on Long Island who are encouraging their employers, students and members to pledge to be car-free or car-lite. Take the pledge at CarFreeDayLI.com! To participate in this event, all you have to do is pledge to be car free or car-lite on Tuesday, September 22, 2015 by filling out the pledge form on the Car Free Day LI website. It's that simple! Once you pledge, you'll automatically be entered for a chance to win great prizes! Already car free? That's great! And since you're doing the right thing, you will also have the chance to win prizes when you fill out the pledge form. Subject: LongIsland.com - Your Name sent you Article details of "Take Mass Transit in Honor of LI's 3rd Annual Car Free Day on September 22, 2015"